Do you know about reducing pain with your Arthritis and other join pain ? FLP brings you the aloe vera drinks combines with other ingredients to reduce your knee pain, arthritis, back pain.. Forever Freedom has combined stabilized aloe vera with Glucosamine, MSM, and Chondroitin for an excellent way to help maintain healthy joint function and mobility. Glucosamine and Chondroitin are natural substances that help maintain the structure and health of cartilage, keeping this natural “shock absorber” of the joints well hydrated. aloe aids the body in assimilating the Glucosamine, Chondroitin, and MSM more efficiently. Provides a unique form of low molecular weight hyaluronic acid, with moisturizing and lubricating properties, plus Ginger Oil and Turmeric - making it one of the most powerful nutritional joint and skin moisturizing supplements on the market. basic functioning of cells, including those of the heart and blood vessels. CoQ10 levels are reported to decrease with age, which is just when we need them most. Forever CardioHealth with CoQ10 provides the extra supply of CoQ10 your body needs. above we have added the heart-healthy minerals magnesium and chromium plus lecithin, known for its blood vessel lubricating and fat-mobilizing properties, and the powerful antioxidant vitamins C and E.
* Provides CoQ10 , ncesessary for basic cell functions. * Contains heart-healthy herbal extracts, minerals, lecithin , and antioxidant vitamins. Forever ImmuBlend™ contains a proprietary blend of fructooligosaccharides (FOS), lactoferrin, maitake and shiitake mushrooms and other specific nutrients designed to support the immune system. It helps the body’s biological defense system to operate at peak performance so you can carry on your daily routine without interruption. ​Our immune-enhancing nutrient blend includes the power of lactoferrin, maitake and shiitake mushrooms, along with vitamins C& D and zinc for that extra boost. * Supports all aspects of immune system function Provides a variety of nutrients to support immune system activity . discussed are not intended to diagnose, mitigate, treat, cure or prevent a specific disease or class of diseases. You should consult your family physician if you are experiencing a medical problem. 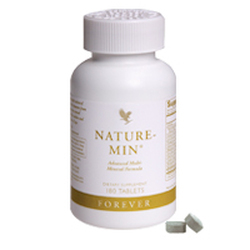 Nature-Min® is an advanced, multimineral formula using bio-available forms of minerals for maximum absorption. It provides minerals and trace minerals in a perfectly balanced ratio for maximum efficiency. Using a mineral base of natural seabed deposits and chelated marine plants and animals, Nature-Min® provides most of the minerals found in the human body. Forever® Nature-Min® is an advanced, multi-mineral formula using new bio-available forms of minerals for maximum absorption. It provides minerals and trace minerals in a perfectly balanced ratio for maximum efficiency. Using a mineral base of natural seabed deposits, Nature-Min provides most of the minerals found in the human body. Some, like calcium, phosphorus and magnesium, are constituents of the bones and teeth. Others are soluble salts that help to control the composition of body fluids and cells.Minerals, such as iron and hemoglobin, perform other vital tasks. They work with enzymes and proteins, which are necessary for releasing and utilizing energy. 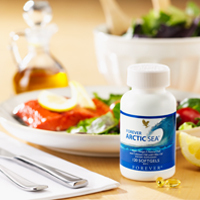 ​New and improved Forever Arctic Sea® now contains a proprietary blend of DHA-rich Calamari Oil, ultra-pure Omega-3 Fish Oil and High Oleic Olive Oil. This unique blend is exclusive to Forever Living and provides not only 33% more DHA per day, but creates the perfect balance of DHA and EPA for optimal health and wellness.